Our purpose and goal is to support your life’s vision by promoting best health daily. At Avicenna Lymphedema Care we offer comprehensive lymphedema care. We provide lymphedema prevention education, screening and treatment. A treatment course is always dictated by the current situation of the patient, financial resources and the individual’s needs. You will be provided with a custom treatment plan that will fit your needs. The end goal is always to enable you to take care of your condition independently. At Avicenna Acupuncture, we believe it is essential to spend time with our patients. We get to know you by listening to and inquiring about your health. A thorough intake will guide the way to successful treatments. Our medical approach is based on the whole person. Our focus is on the root cause of a physical or emotional symptom. At Avicenna we provide treatments based on Traditional Chinese Medicine. We believe that the body can heal itself when given the right conditions. We will create those favorable conditions with and for you. Factors that can cause disease may be related to environmental toxins, emotional stress and/or trauma. Petra E. Schalk L.Ac, OTR/L, CLT, LANA has been an Occupational Therapist for more than 15 years specializing in Lymphedema Treatments and Cancer Recovery. At Avicenna Lymphedema Clinic, she provides comprehensive Cancer Care including palliative intervention. As a lymphedema specialist Petra treats primary and secondary lymphedema including children. If you should be affected by Lipedema Petra E. Schalk will help you to find a Physician for diagnostics. Unfortunately this condition is widely unknown in the medical community and a specialist eye will assist you in finding your path to greater health. Petra is skilled in recognizing Lipedema and will assist you greatly in controlling your condition. 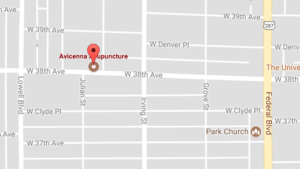 You will find Avicenna Acupuncture Clinic conveniently located in Highlands Denver. Acupuncture treatment has been used for centuries to assist with the recovery of a multitude of health problems. The World Health Organization (WHO) recommends acupuncture for many conditions. You can find more specific information on the page dedicated to acupuncture, lymphedema & fibromyalgia treatments.